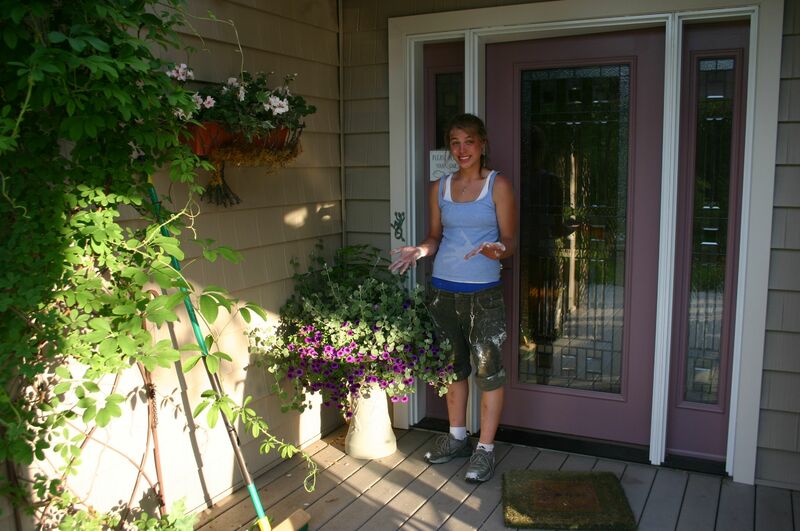 Here’s the finished effort, although I still might add some earthenware beads around the entryway. This was 6 panels, done largely by very small hands. I gave the panels a simple tumble through a short cycle in the washing machine to further tighten up the wool but it was impressive how well the children managed to hand felt these panels without holes or gaps. 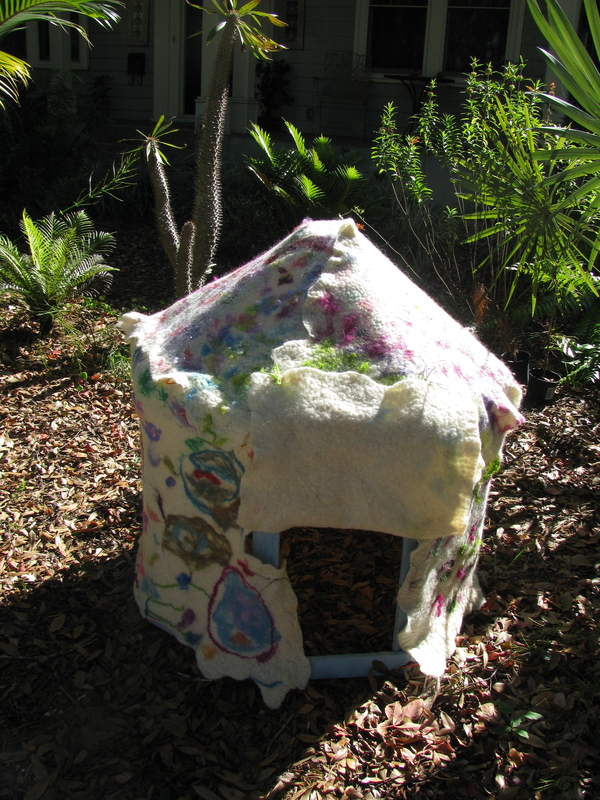 The cats are in heaven and wondering why there hasn’t been a wool yurt in their lives before this. It stands almost 3 feet tall so it’s plenty roomy for two cats. They like it best with the flap closed, thank you very much. 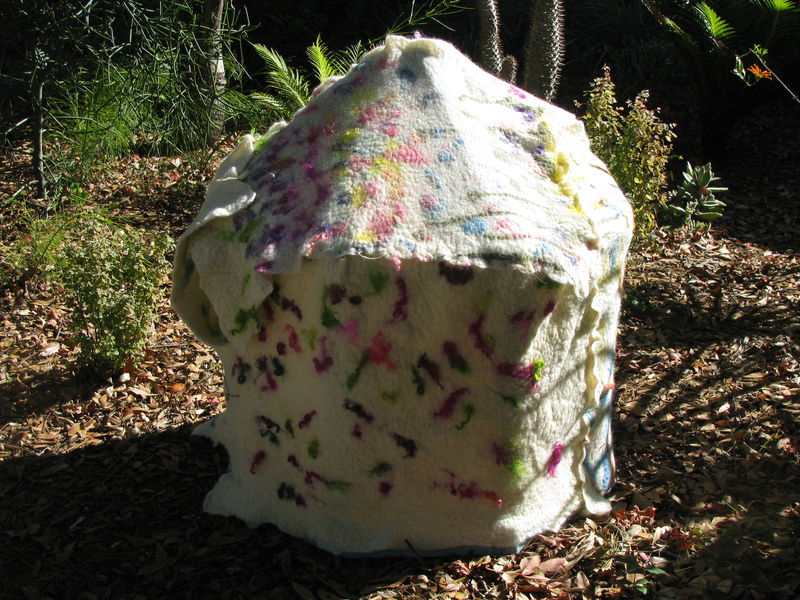 The colored bits and pieces of wool and fleece that the children chose for surface design make this yurt a bit more flashy than most authentic Mongolian yurts, but, you know, those Mongolians could take some design cues if they were so inclined. The yurt has been here for a couple days while I hand stitched the panels together and tomorrow it will go back to the Morean Arts Center and be on display there until further notice. And then, the cats want it back. Now don’t you want to see what this was all leading up to? More photos soon, promise. I’m having a swell time in Miami, although it’s taking a little effort to enjoy the deco architecture while sidestepping the conspicuous consumerism. Ack, ack, ack. Never saw so many stores selling 500.00 sunglasses and skimpy bathing suits. The bathing suits are a reminder of way back when and my current age which necessitates a solid state Speedo tank but it doesn’t hurt quite so much today when the high temp was 59 f. Everyone was bundled up in wads of towels around the pool; still, when the sun was out it was that nice kind of chilly warmth. I read a lot, napped some, hunted down some good Chinese food for lunch…I’ll have a lengthy update with photos soon. Right now I’m still suffering intermittent connection failures so I’m going to make this short. 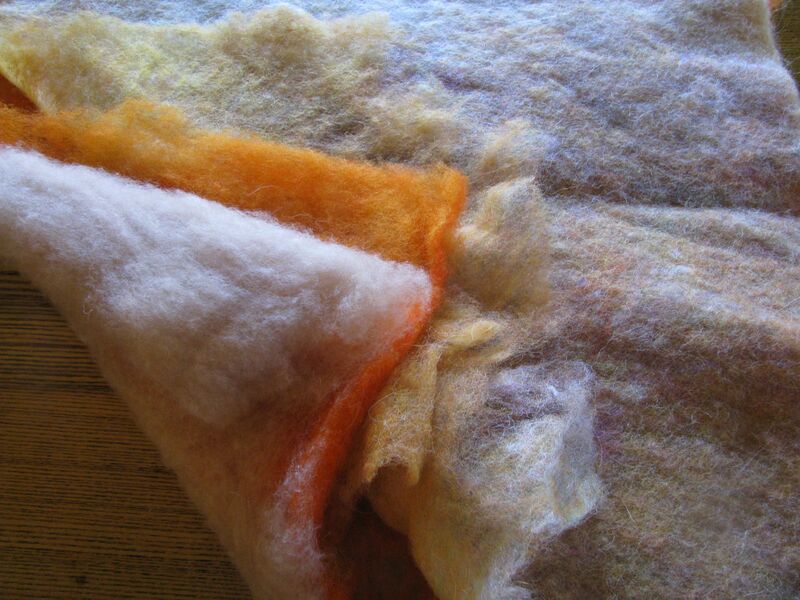 This cold weather is just perfect for making, altogether now, FELT. 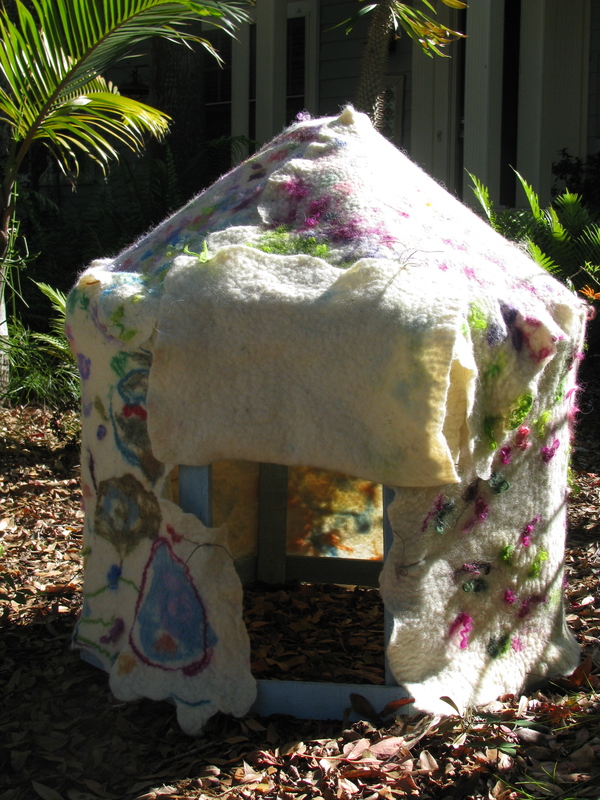 On Saturday, at the Morean Art Center in downtown St. Petersburg, I’ll be leading a family art day as we make a real Mongolian Felt Yurt. We’ve ordered in a giant load of raw wool and trusty Russ, one of the great crew working at the Morean, has constructed a rockin’ yurt frame. 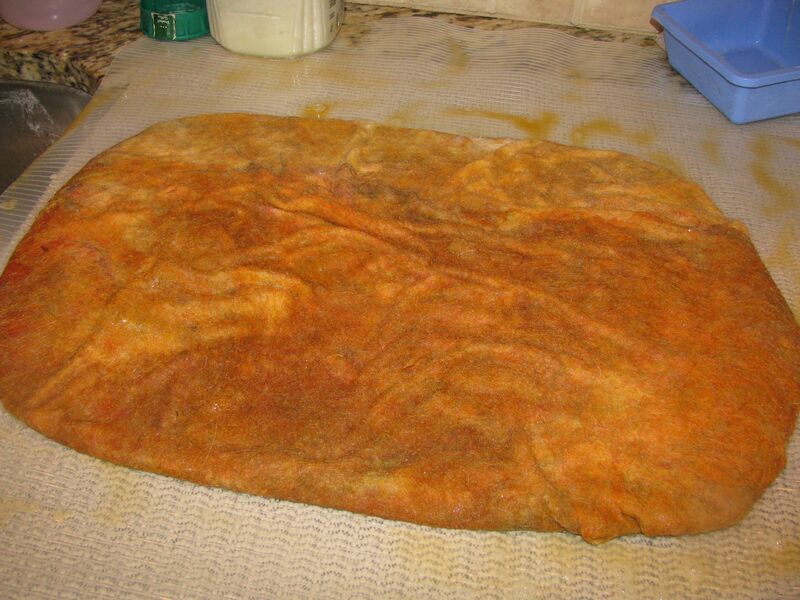 I have giant mats and I mixed up a gallon of olive oil soap gel before coming to Miami. 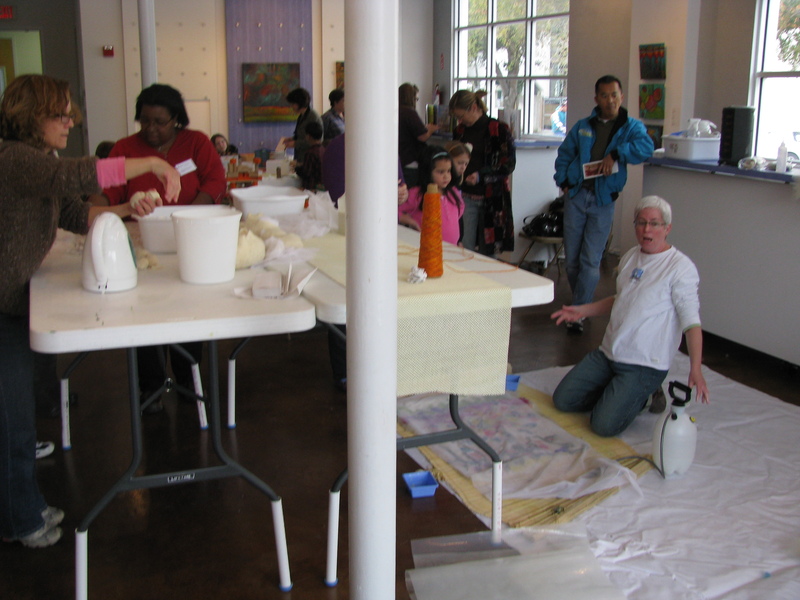 I have my industrial sprayer ready and a big bag of brightly colored wool odds and ends for design and embellishment. This, my friends, is going to be fun. I know. You thought I was already south but it’s awfully darn nippy around here. There’s another blanket on the bed and Sophie is literally cramping my style by tucking up tight against the back curl of my knees as I position myself for sleep and then she spends the rest of the night sending me those intense telepathic messages: “Do not move. Do not move. Do not move.” They work, too and then when I wake up it takes me 10 minutes to unfold. So Rich has business in Miami and believe it or not, I’ve never been. It will have him on South Beach at a very fancy hotel and when he said, “Can you get away for a couple days? Other than one nice dinner you’ll be mostly on your own…” I thought, “This is the mini-vacation designed for me.” It’s been hectic gearing up for felting classes and workshops and getting ready to spread my wings on a new juried exhibition in February. I intend to be the ‘mixed media artist extreme” for that show, stepping outside my usual boundaries of nice and useful felted artwork. Look out. Miami is only looking at highs of 70 and lows of 45 for the next few days but it’s warmer than here where all the outdoor plants are looking limp and hanging on for dear life. Funny how your tolerance for extremes narrows as you narrow your exposure to life’s extremes. There’s a message in there. You’ll find me by the pool in a hooded sweatshirt or walking along the ocean these next couple days. The internet connection has got to be better than what’s been going on here at home with BRIGHT HOUSE. (BH, you thought I was kidding when I said I was going to launch a public campaign against your weak signal and crummy service. This is only the beginning…Big Love should not be cutting out on me every 8 minutes. I don’t deserve that. Next step? Take one months service bill and spend it on a newspaper ad instead. 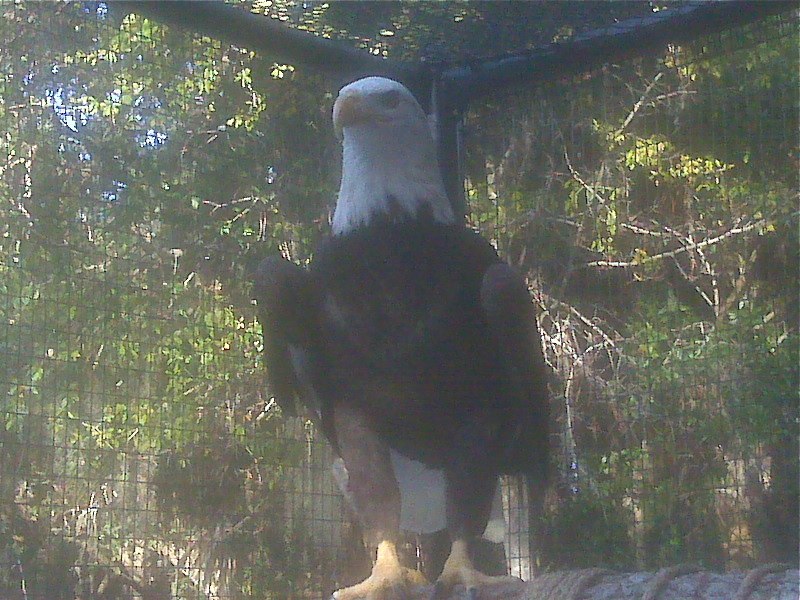 And you know, around here, people still avidly read the St. Petersburg Times.) I’m going to read, knit, plan extreme felt and get caught up on correspondence. That means here in the blog ‘hood, too. Abby and Misha arrived home at 3 am after numerous airport delays. They still swear by Singapore Air and say it’s real luxurious flying. They unpacked all their souvenirs for friends and family (I got premium vodka and a Matryoshka kitty doll- she repeatedly holds birds and cooking utensils. Both fitting gifts. ), did their laundry and and promptly got sick, possibly H1N1. True to form, Abby also immediately got a full time job offer working for the government and she starts today, sick or no, over my objections. 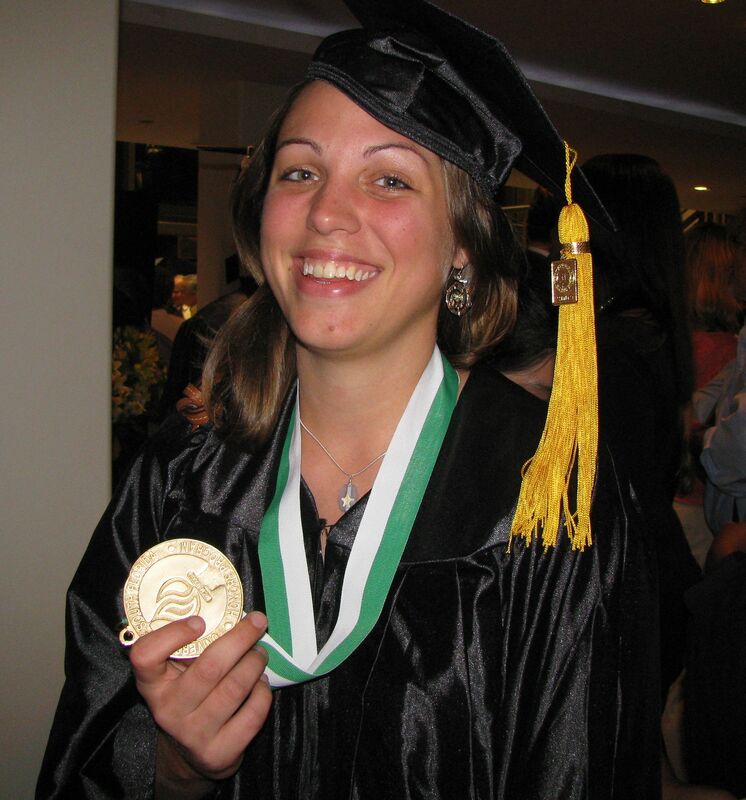 She’s looking forward to a semester of work while she waits to hear on grad school application). Stay warm. And, Bonnie? All 12 points, amen! and Om Shanthi. Shanthi. Shanthi, too. A blessed Epiphany to you! Exhausted, after a night of vivid dreams interspersed with ant farming. The update on the ants: They’ve brought in the big guns to investigate the chemical warfare in the bathroom. Previously, they were eensy, beensy, teeny, tiny. Now there are a few with big heads, relatively speaking. But I don’t know if they are relatives or not, perhaps they are the head ants. Or perhaps the bait has attracted a whole new variety. Anyway, bigger heads mean bigger ant jaws, right? Now I put on my ridiculous orange felt clogs before going into the bathroom in the wee hours. 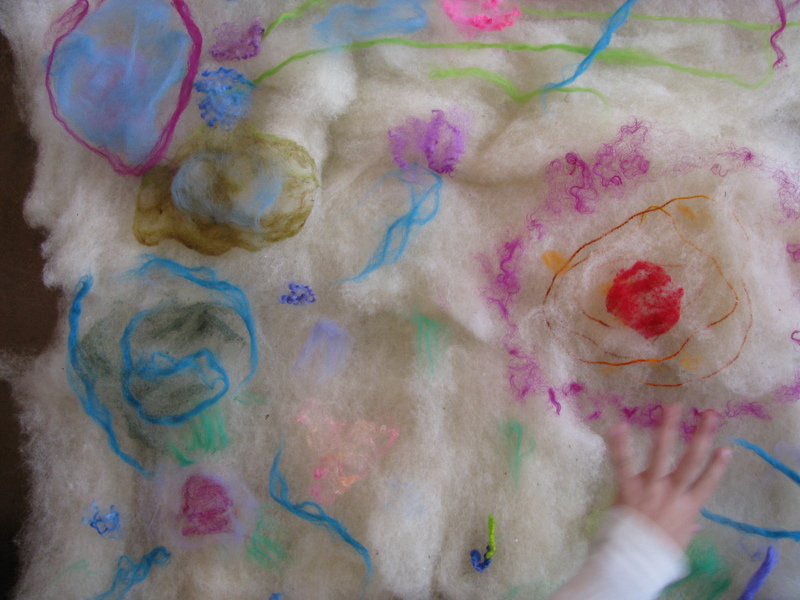 Wool “felts” with soap, water and agitation. That’s because it’s an animal protein fiber with little cuticles all along the shaft of every single hair. 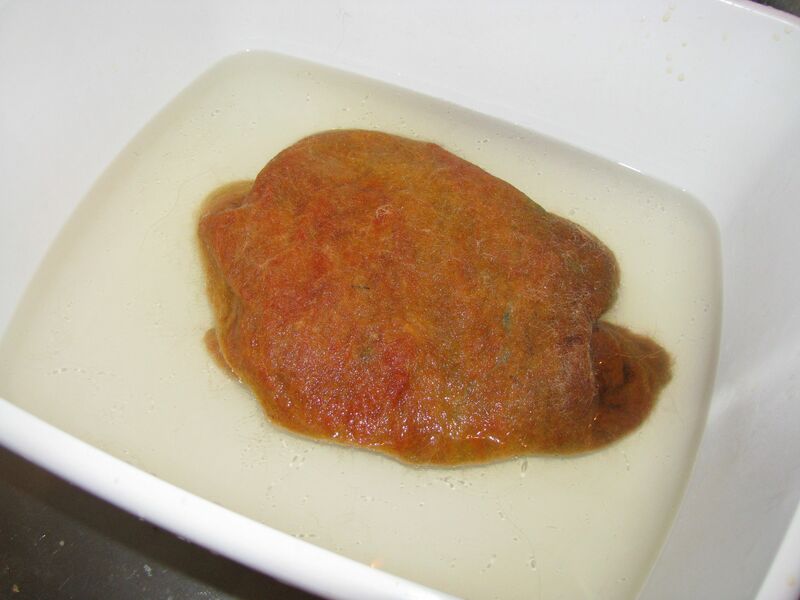 The soap changes the pH, the moisture opens the cuticles and the agitation tangles it all up. Think of your hair on a high humidity day. 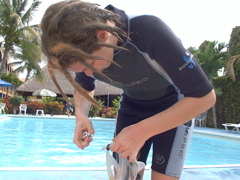 Better yet, think of the Snarl’s hair when she decided she would look better in dreads. See? 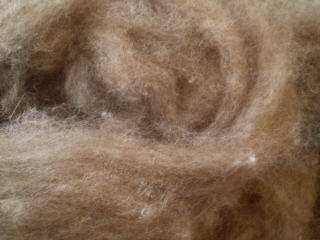 Felted animal protein-based fiber. And just as some human hair is more inclined to dreads, different sheep have wool that is more or less inclined to felt. Dozens of different breeds of sheep- some with fine fleece, some with coarse, some with curly (we call that crimp) and some with shaggy. And then you can throw into the mix alpacas and llamas and rabbits and camels and Samoyed sled dogs and so forth and so on. 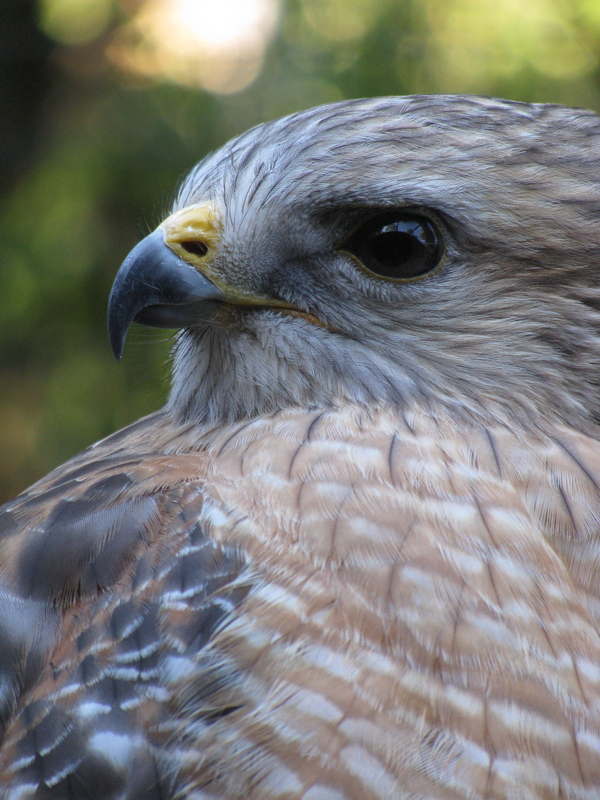 For thousands of years humans have been using animal fleece for clothing and shelter, and much of it has been in the form of felt. Knights in armor wore it underneath. 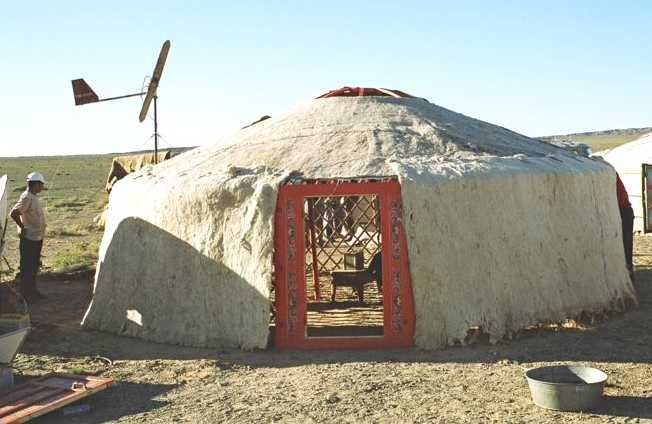 Mongolian nomads use it for their homes-yurts- to this day. It’s strong, warm, cool and hydrophobic. Almost waterproof. When I felt, these are my basic tools. Hot water, a ridged mat that works sort of like a washboard and a soap gel I make out of pure olive oil soap in the blender. I’m not sure it’s doing wonders for the blender but even after hours of felting, my hands stay soft and unchapped. On the mat you see wool in 3 stages: straight off the sheep, washed and carded and finally, blended into an artistic and copasetic ball of fleece. This one is a wonderful combination of alpaca, merino wool and angora rabbit. Today I wanted to see how well this combination would felt together, what the final texture would be and what it would look like, so I felted a tiny sample. First thing I do, while my water is boiling, is spritz the fiber with some olive oil soap dissolved in water. 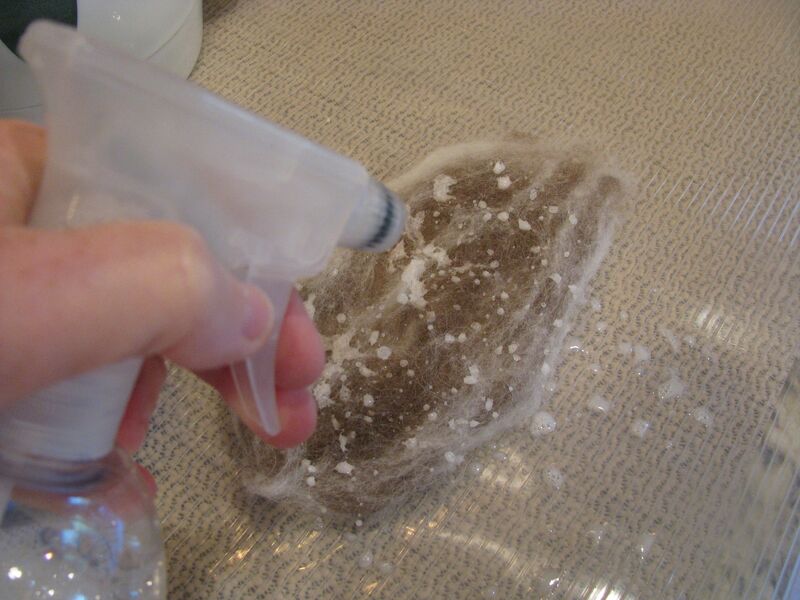 Then I sprinkle it with really hot water (I prefer felting this way. 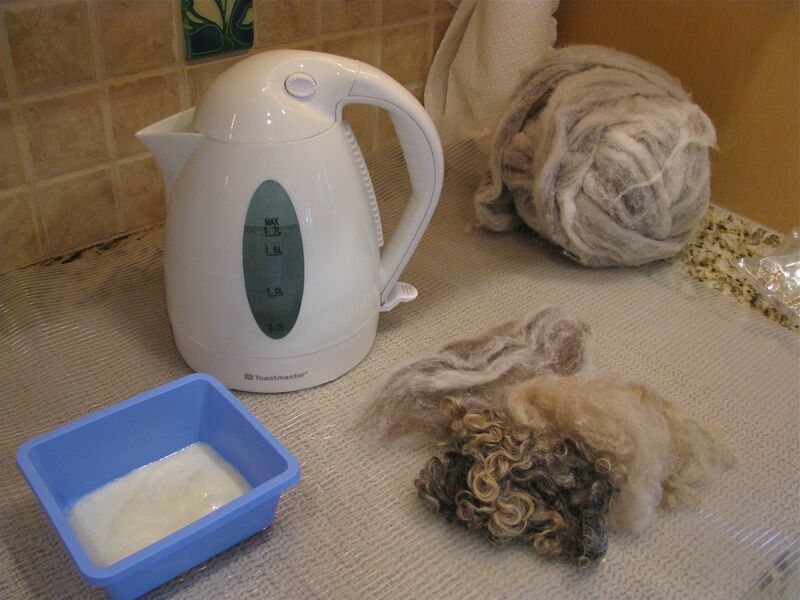 Wool will felt with less hot water but it goes more quickly when the water is very hot. Then comes the laying on of hands. With a fair amount of experience under my belt I sometimes have a good sense of how to balance the felting pace and agitation and still have it all hold together. Sometimes. Early on, I had big clomps of wool sliding every which way, partially felted and full of holes but not so much, now. Moving right along (and skipping the process part, because I’m ‘splaining it to you rather than teaching you), it turns into felt. See? This is a really super combination- pretty luxurious- and I think I will make some slippers out of it. Stay tuned. Oh, look. When you weren’t here, I dyed some wool (Another time, if you’re interested, we can discuss natural dyes, acid dyes, why all my clothing is blotchy with odd colors and so forth and so on.) and now I’ve made another sample. This one has 3 layers of fiber: a very soft natural light brown camel- camel is SOFT but doesn’t felt all that well by itself-and some corriedale dyed orange and an icelandic wool dyed in shades of yellow and gold with a few incidental streaks of random bright color. 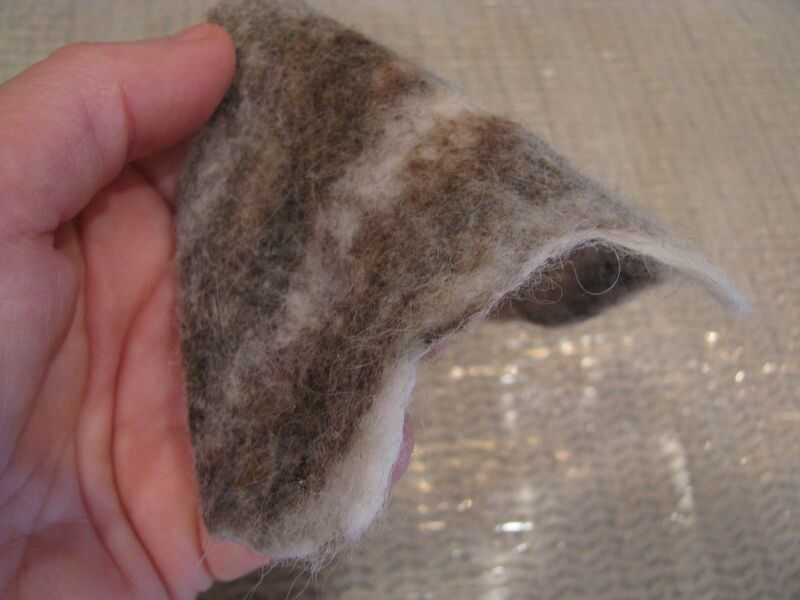 Since different wool felts differently and sometimes felts to itself but not with other wools (again, think of the variety of human hair types)I do another sample. My sample says they will work okay together. Here I have pulled the fibers apart and then laid them out in layers (skipping through a lot more steps). I want to make a bag to carry knitting projects in when I travel. I calculate the size of my layers taking into account a shrinkage rate of about 30%. That was another reason for doing a sample; different wools shrink at different rates. Consider the cashmere sweater you accidentally threw into the wash and now fits your daughter’s American Girl. Lots of knitters purposefully knit giant projects and then throw them into the washing machine so the visible stitches shrink and disappear. That’s another way of creating felt. Here’s something I wonder about: after a particulariy rainy spell, why aren’t there miniature sheep all over the place? Okay, then. For this project, I want it to be three dimensional, i.e., I want to be able to open it up as a bag, so I wrap my layers around a plastic place mat. 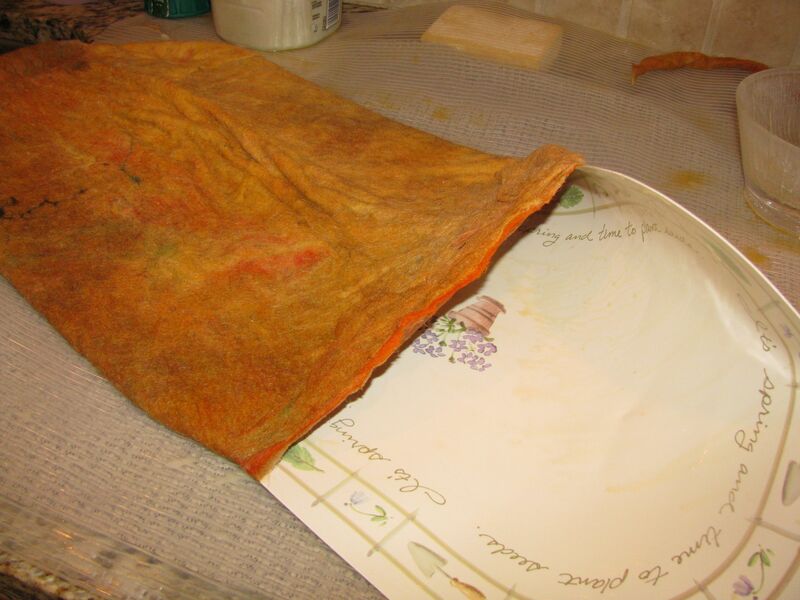 The place mat acts as a “resist” and keeps the inside from felting to itself. Layout and wrapping takes practice, lots, to get a feel for making an even fiber, without holes and, in this case, strong sides. Back into the kitchen (or the back porch where I have a large table or into the Morean art studios where we have really large tables and lots of light and space for classes). 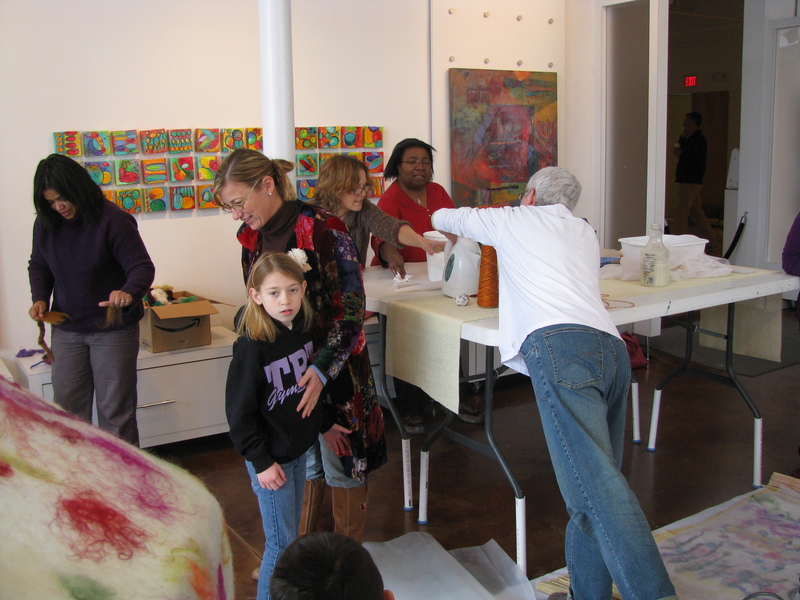 I begin applying hot water and soap and working the whole project carefully as it starts to take shape. In the beginning all those loose fibers want to fall apart but then, slowly, they begin to pull together and I gradually increase the agitation and pressure. 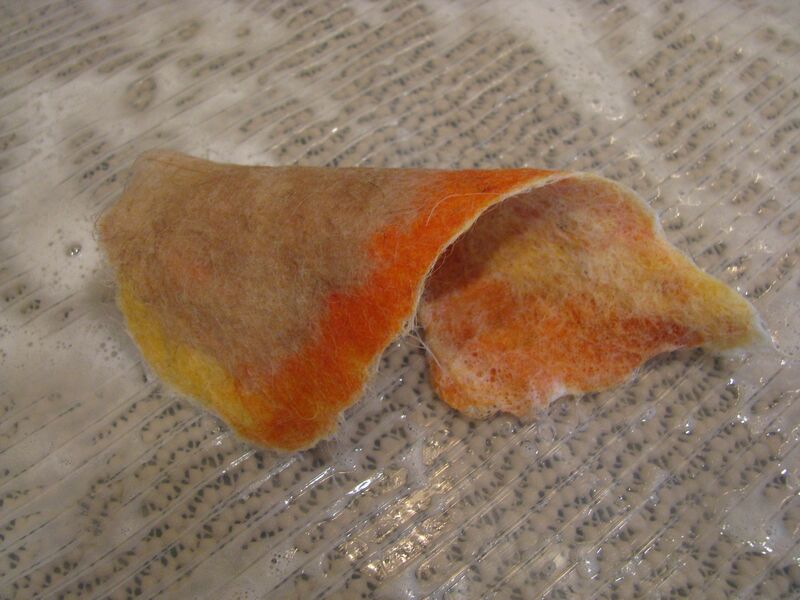 This is basically the process I’m teaching in my wet felting classes so you’re just getting the brief overview here. Come on by for 6 weeks or so. Here, you can start to see it taking shape around the mat- but it’s still loose and floppy. All those wrinkles? They have to be carefully worked out. After I have the felt holding together well enough that I can maneuver it, I liberate the place mat. Even the insides have started to hang together and once the resist is out I carefully work the fabric evenly and consistently against the ridges of the plastic mat I work on. I’ll turn the whole thing inside out, back and forth, taking special care with the cut edges so they felt rather than remain raw. 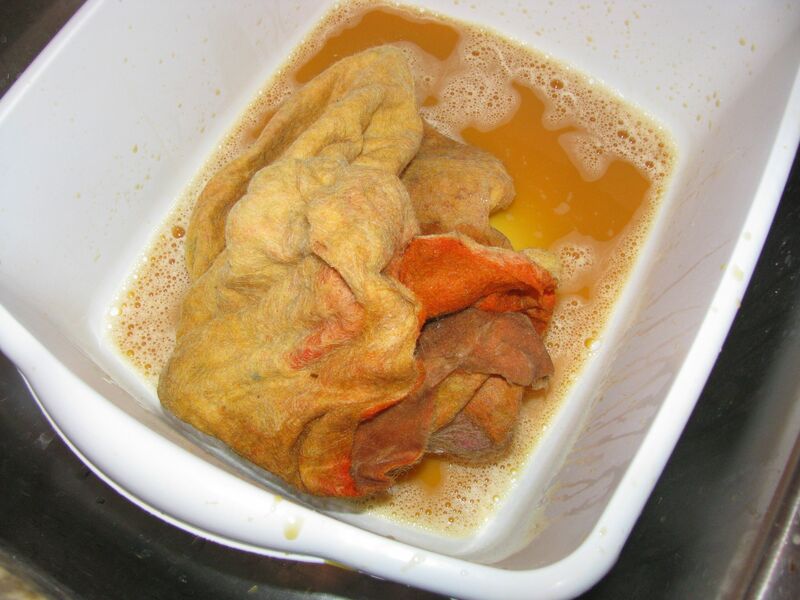 Depending on the nature of the wool, it takes more or less water, more or less soap. This project “ate” soap like crazy. Among other things the soap keeps the surface slick and from sticking to my hands in the early going. Periodically, I have to wring out the water and soap and start over with more hot water. Ruh-roh. Somebody didn’t set all their orange dye and it’s running out. Somebody has a big orange wet swath across the front of her shirt today. This happens often, depending on the dye and oranges and reds do it more, I think. It doesn’t bother me because the orange is so intense and even after the excess bleeds out there will still be great color. There’s only so much color a fiber can absorb. Also, I’ll ‘set’ the color in a minute… …by giving it a final rinse in water with vinegar. The acid sets the dye and also neutralizes the alkaline soap, closing up the cuticles of the fiber (think “cream rinse”). In between these two pictures I’ve gotten my fiber the thickness, strength and size I want it. In addition to felting the wool, I’ve “fulled” it by throwing the whole wrung out mess repeatedly into the sink (or tub). That’s like a final tangling. Flinging this stuff with all my energy is also a good way to release a lot of pent-up frustration. About ants. Remember, this needs to be a tough little project bag. 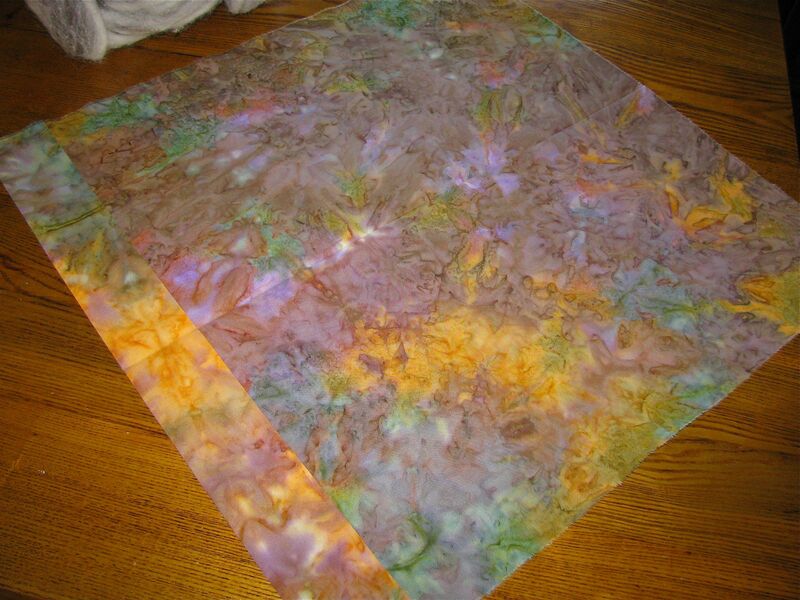 If I were working on a fine silk and merino nuno felted scarf I would not be aggressive with it. Now that I’ve blocked the piece, pulling it into the right shape and toweling a lot of the moisture out, it’s outside in the 65 degrees and sun, drying. Sorry about that, you in Minnesota and Chicago and Michigan…I’ve moved on to picking out a fabric to line my bag and I’m pretty sure I like this colorful dyed cotton fabric. It’s a little small so I may have to piece it but the colors are perfect. It’s funny, the things that motivate a person to keep blogging. I’m pretty ambivalent about the process these days because. although I find the updates about other people’s lives- snow storms, giant cows, RV interiors- to be consistently interesting (I’m serious, I love them)- rehashing the details of my life is sort of boring to me. I guess in that regard I don’t really play well with others. But Bonnie checked in and I also got an e-mail from a new visitor and fiber artist, who lives near the Asheville house so those were both rewarding enough to get me back here in fairly short order. I commented last post on how I was channeling my mother’s perfectionist tendencies. Bonnie used to write, “Call your mother!” Conversely, my mother calls on me and not always in favorable ways. I’ve said often enough before that she wasn’t all that big on mothering and it was only later, after we fell out of that relationship and into one of friendship that we grew close and then she didn’t stay alive long enough to suit me. 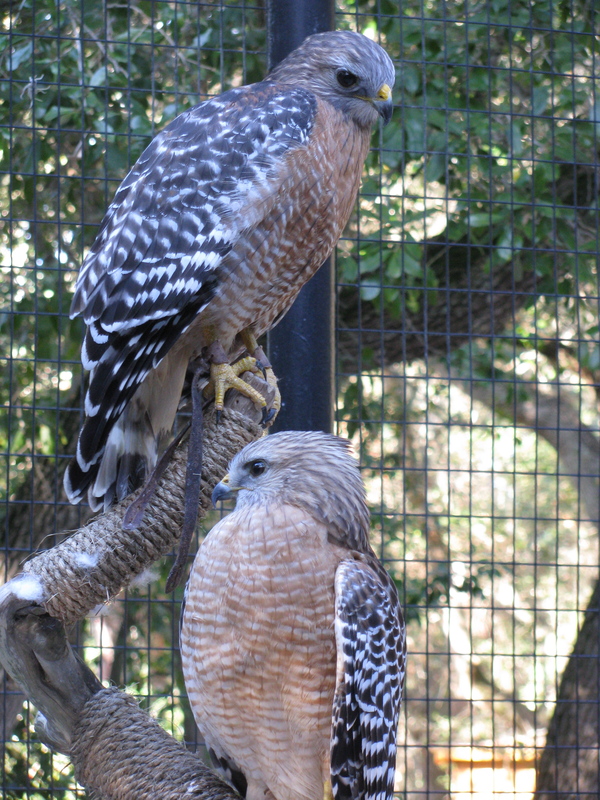 But here was one of the really neat things about my mom: she always let us have just about any pet we wanted. We had felines and rodents and bunnies and fish and all manner of creatures. The least warm and fuzzy but one of the most interesting was my brother’s ant farm that he got for Christmas one year. I was insanely jealous but he was unusually hospitable about letting me in his room and together we watched those industrious and organized busy bodies for hours. I’m sure, more than 50 years later, my memories around the ant farm have been revised but it seems like it came fully stocked with ants and they lived a really long time. I remember watching them hustle up and down, up and down between the clear plastic walls, endlessly rearranging white chunks of inorganic stuff, sustained only by the daily addition of sugar water. This year, Rich and I exchanged very small gifts and it was just right. He gave me some very cool sparkly pipe cleaners and sheets of colored foam and a box of crayons, all items that stir my creative juices thinking about how I can incorporate them into my fiber art. He also gave me a jar of Smuckers butterscotch ice cream topping that I can eat in bed late at night while I read. I don’t like ice cream, just the topping. But in addition to those gifts, it seems I got my very own, very extensive ant farm for Christmas. It’s in the bathroom. What started out as a minor irritation has now grown into a somewhat alarming fascination and I find myself studying these ants with the same intense curiosity I had as a child staring at Bruce’s ant farm. Here in Florida there are more insects than you can ever hope to eradicate, should you choose and more and more I’m getting into mass extermination. I found dry wood termites in a piece of antique furniture- that was a horrific little mini nightmare. The garden has behemoth grasshoppers, there are banana slugs the size of apple slices and the mosquitoes are vicious high velocity whiners. Feeding the raptors, I encounter all manner of biting, stinging, flying, creeping, crawling bugs and a recent necrotizing lesion on my hand was diagnosed as from a venomous spider bite that I know for certain was lurking in the gauntlet I wear to perch the hawks (I know, you want pictures and frankly, a month later it’s still gross and itchy but I’m not posting photos). That one tipped me over the edge and I’ve become a serial killer when it comes to anything with more than four legs. Except butterflies. So. When ants appeared again in the bathroom- they come and go every few months depending on the weather- I decided to erradicate them. Especially since I am now convinced that of the insects that are either eating me or eating the house and furnishings around me, it’s probable the ants are doing both. I went to Home Depot and revisited the pesticide department to find the most deadly product available against ants. I settled for one that “Kills the QUEEN and the ENTIRE COLONY” by luring those little worker guys into carrying the poison back to “the nest.” I put the baits out right near the wall by the toilet and now that I turn the light on in there at night (because I have to make sure they aren’t climbing up my legs and biting me while I pee) I’ve started watching the action. And here’s the thing: I don’t think that poison is working the way it’s supposed to. When on Christmas Eve, in the true spirit of the season, I put those ant traps out there were a few ants wandering around in seemingly aimless circles on the bathroom floor. (Only seemingly because ants are never aimless; they always have the purpose of colonizing first my bathroom and then the world). When I got up during the night on Christmas I paid close attention for about ten minutes and that was when I realized they were just like those industrious critters in my brother’s childhood ant farm. They were definitely coming in a straight beeline ant line from a specific tiny spot under the molding and heading for the bait, going into it and then going back from where they came. Ah, hah! it’s working, I mistakenly thought. I checked on them several times during the day yesterday and they were still coming, always six or seven of them and for all I knew, it was the same six or seven. I was also pleased to see that there were some stumbling around drunkenly and there was a small assortment of tiny ant corpses here and there and I made a mental note to sweep them up later. Well, last night, as I watched them in the wee hours (I think that’s a pun) I realized that the dead ants were gone and then I saw a couple ants carrying ant bodies away under the molding. There was a curious little crowd of them gathered in one spot and I thought maybe they were holding a funeral or saying mass or something. I was just considering the organization involved in ants carting off their dead when McCloud came in to meow for a midnight snack and he snuffled the bait trap. As I started to nudge him away he bumped it and-horrors!- about, umm, a thousand ants came racing out and headed for the woodwork. Seriously. A thousand little ants were in that bait trap. They all disappeared quickly and this morning when I went in there were the same six or seven ants going steadily back and forth between the trap and the wall. They had tided up the place nicely during the night, carting away every speck of dust and ant carcass and for all I know there are still a thousand in that ant bait thing. I’m afraid to touch it so I’m just going to watch it closely for a few nights. Felting. I’ll be back at it tomorrow after taking a few days off to enjoy Christmas. I would have enjoyed felting right through Christmas but at some point it made sense to put away all the fleece around here. While I was interim knitting away, I started thinking about a larger (BIG) project I’m working on for submission to a juried exhibition coming up in February. I’m going to be incorporating a lot of fused silk and cotton gauze along with the wool and I’m thinking it’s going to be pretty challenging. I’m feeling cautiously excited. My work with fibers has become more and more a part of my life these days, as I teach and work on my own creations. I’ve considered breaking off to a separate blog as a place to share that but then I think I might abandon this blog altogether so I’ve decided instead to just incorporate some posts about felting along with everything else and it’s just fine if it’s not everybody’s cup of tea. But if you’re curious, stick around. 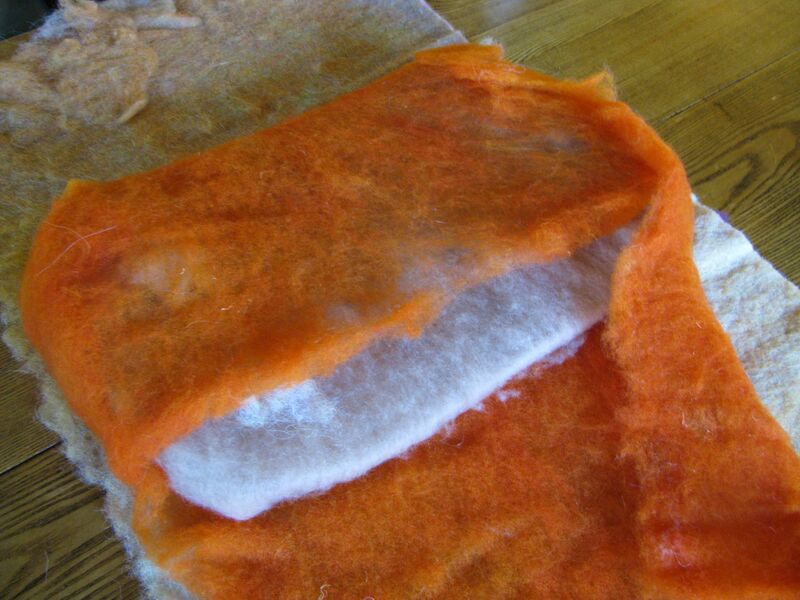 Tomorrow I’m going to make a felted bag out of some really luscious angora/alpaca/wool blend that I received as a Christmas gift from my good friend, Marion. Because some of you have asked, I’ll take step by step photos and show you the process from start to finish. I hope you’re having a lovely holiday break from work and day-to-day. There’s snow tonight in Chicago and Ann Arbor- and I think some still in Asheville. None here. A night time snowman project would be fun right about now. 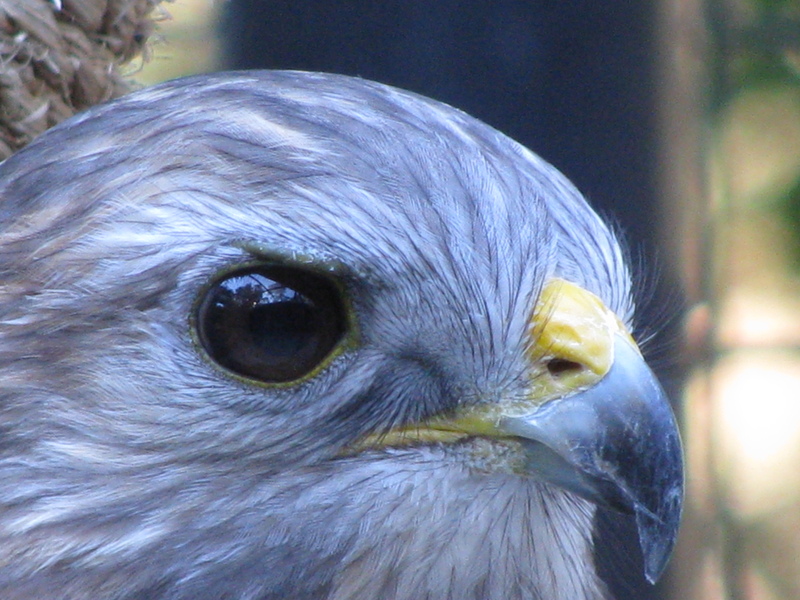 …and, despite a huge crisis of confidence, turned it all in. Just as I was packing my boxes I got an email from my friend in Minnesota who is going to Camp PluckyFluff next weekend to do some extreme fiber spinning. By then I was so over the top that we got to laughing hard about Camp FucknFelt here at my house and agreed that this time next year we could be running the BCMA camp from a base in Asheville. I dropped off my work at the gallery and we got it all barcoded and they seemed very pleased with it and asked me to help them with the holiday windows. Then I cleaned the house. Yes, I did. And yesterday morning, bright and early, I headed down to the EarthBox Research Center and bought the seedlings for my winter garden and some new covers and fertilizer and came home and got those planted up. Blake Whisenant, EarthBox inventor, was still there, still planting and we said hello and laughed about surviving another summer. This is really perverse; where I come from everyone comes outdoors on April 1st and smiles about surviving another winter. Then I stopped at the bead store briefly. Soon we had hundreds of little goblins and witches on the doorstep for trick or treat. Halloween is huge in St. Petersburg, especially here in the Old Northeast, where streets get closed off and the houses decorated beyond your wildest imagination. They are themed (Harry Potter, Wizard of Oz and this year an incredible Thriller display that included Jackson rising from the dead in a graveyard and a huge video screen playing the original Michael Jackson music video. News crews come out from all over, there are contests and children are brought in by the busloads from other parts of town to enjoy the sights and sounds. After bedtime, the adults take over with rolling golf cart bars, giant porch parties and a live music stage. It’s basically the scariest, spookiest and biggest block party ever. After we handed out candy we walked around with the neighbors for about an hour and then I was done. Have I mentioned that it seems to be hot down here? We hit 91 Friday and yesterday evening was still extremely muggy and hot. These are both news photos. The streets were so crowded and wild that I didn’t carry my camera. Rich estimates that t one point there were a couple thousand people out in our three block area.